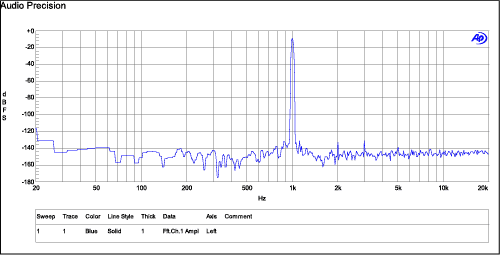 We would like to use your audio analyzer as a source for testing some of our high performance audio ADCs. Can any of your models take a 10 MHz reference clock for synchronization, to allow coherent sampling data capture of an integral number of test frequency cycles from the output of our ADC? You can sync our 2722 analyzer to an external 10 MHz reference clock. However, this requires that you use the Sine D/A generator, which digitally creates a signal and passes it through an internal D/A to the analog outputs of the instrument. This limits distortion measurements to –120 dB. For higher performance, you can use the analog Sine wave generator. The analog generator can not be synced to an external reference, but this is not necessary when doing an FFT with synchronous frequency correction. Fig 1. 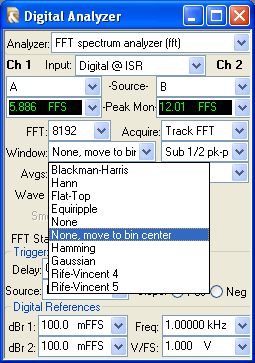 Digital FFT Analyzer with”None, Move to Bin Center” selected. 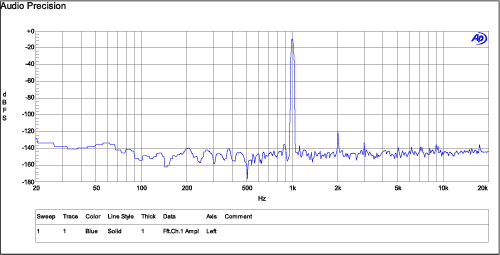 Frequency error correction is described in the AP2700 help system under the topic “None, Move to Bin Center.” This is one of the FFT Window choices on the Digital Analyzer panel when the Analyzer is set to FFT spectrum analyzer (see Figure 1). It’s a bit of a misnomer, because it’s not really a window at all. Instead, the system resamples the acquired waveform so that an integer number of cycles of the acquired sine wave fit into the acquisition buffer. As a result, a leakage-free FFT can be produced without a window. Essentially, this achieves what you are looking for—a coherent signal—without the need for a sync signal. We’ve created a small example with an ADC that we had on hand, to illustrate the process (please see the associated download file “AP2700 Frequency Error Correction Test”). In this test, the analog output is set to balanced, and the input is set to Digital Balanced. 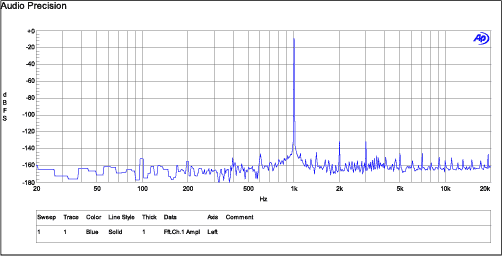 The ADC was set to a sample rate of 48 kHz. Fig 2. Sine D/A generator, FFT with Equiripple window. 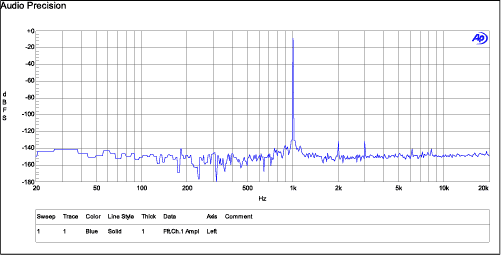 Figure 2 shows an FFT measured with an Equiripple window, using the Sine D/A generator set to a frequency of 1 kHz. Fig 3. Sine generator, FFT with Equiripple window. In Figure 3, the analog Sine generator has been used to generate the same signal, and again an Equiripple window was used. Fig 4. Sine generator, FFT with frequency error correction (None, movetobin center window), no averaging. Figure 4, shows the spectrum measured with the analog Sine generator and the “None, move-to-bin-center” window setting. As shown, the energy of the fundamental frequency is essentially contained in a single FFT bin, and the level of the first harmonic (2 kHz) is at least 10 dB lower than as measured with the Sine D/A generator. Fig 5. Sine generator, FFT with frequency error correction and synchronous time averaging (64 averages, sync, realign first). Figure 5 is the same measurement as Figure 4, but in this case, synchronous time domain averaging (with 64 averages) was used to reduce the level of the non-coherent noise in the spectrum.